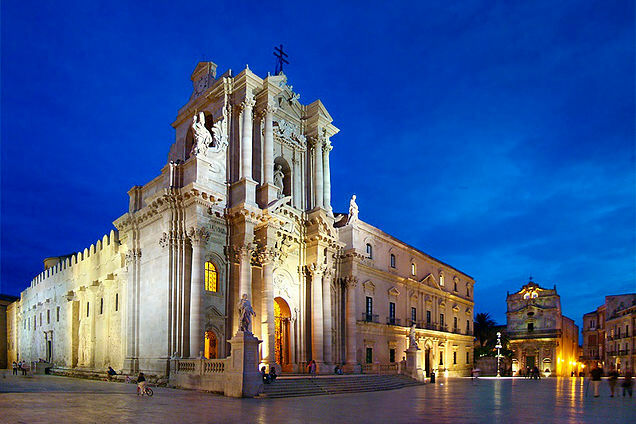 Ortigia, unique Old town extended on an island steeped in colors, sea, art and culture; flavors and traditions that run between streets and alleys. Two bridges connect “U Scogghiu” (the old quarter in popular dialect) to the Mainland marking time between the dock and the wide natural shaped Big Port, already ‘site of epic battles against the Athenians and Romans. Witness of the Greek Vestiges is the main Alley that undergoes a large enclosure where you can find the ruins of the Apollo Temple: the oldest in Sicilian Doric Age. In the center of the island there is a square dedicated to Archimedes, the most ‘famous son of Syracuse, adorned by the monumental Fountain of the Goddess Diana. The charme and elegance of the surrounding roads from here lead to the splendor and brightness of Piazza Duomo. A triumph of baroque buildings of great architectural variety: the former Archbishop’s Palace, the Church of Saint Lucia alla Badia, Palazzo Beneventano del Bosco, the town hall, the Cathedral. The latter, with its’ unique feature , was built upon the ruins of the old doric Temple of Athena, witnessed by the capitals, columns and architrave visible from via Minerva. Inside the Cathedral, the silver statue representing Saint Lucia, the Christian Martyr venerated all over the world. The re-enactment of the Myth marks its highest moment in the enchanting scenery of the Arethusa’s Fountain. A freshwater spring, two steps from the sea, full of ancient papyrus plant. The Legend says that the nymph Arethusa in trying to escape Alpheus, jumped into the water and reappeared here in the form of spring. But Alfeo reached her at sea by mixing the water with hers. Countless and endless testimonies of architecture on the island. A lot of Christian Churches but also valuable Buildings, perfect blend of baroque, rococo, classic and liberty. Suggestive districts follow one another from alley to alley: From the colorful fish market and its typical products with the ancient Mastrarua to the fishermen’s district Graziella. The recently restored old Jewish quarter of Giudecca up to the Buildings of Via Roma and Via Maestranza. And on the rocky part of the port, , the thirteenth-century Castello Maniace, built by the eponymous Byzantine general who conquered Siracusa for a short period to defend the Island. It is difficult to tell of Ortigia in a few lines. It is a dream turn into reality, to be lived during day, enjoyed at sunset and enjoyed at night.